Ciao lovelies! Today begins my favorite month of the year, October! 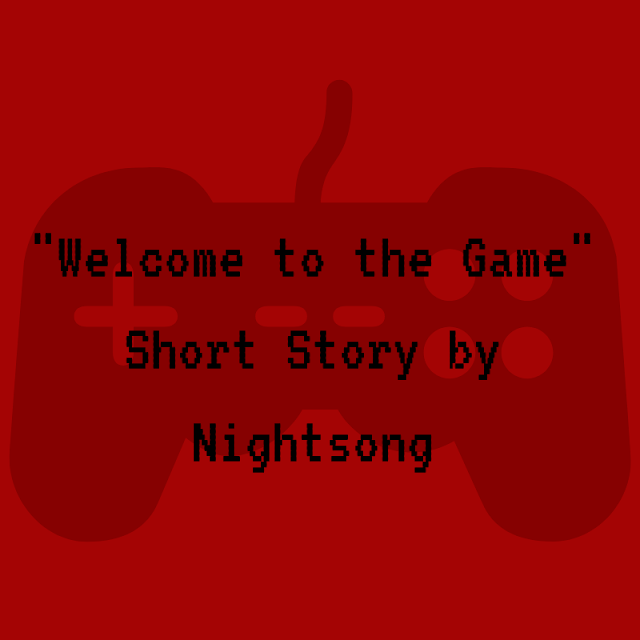 So in honor of this month, here is another amazing story by Nightsong! CONTENT WARNING- CONTAINS GRAPHIC IMAGERY AND SUSPENSE- READER DISCRETION ADVISED. The clicking of his computer mouse was like morse code, rapidly firing secret commands to the animated character on screen. Jake leaned back in his chair, stretching with his free arm and running a hand through his pale blond hair. Lightning cracked outside. The summer air was thick, crackling with the tension of the storm about to unleash. The clock on his bedside table read 3:15 AM and his homework still sat in his backpack, untouched, as he’d tossed it onto his bed that evening after school. Senioritis was coursing through his veins and nothing but games and food filled his active thoughts. Jake continued clicking away, slouched in his chair and playing through the game, blue eyes slightly unfocused, though it was unclear whether due to the boredom or lack of sleep. The enemies were familiar, the puzzles routine, yet he knew he wouldn’t be satisfied until the completion bar showed 100%, all secrets unlocked, all easter eggs found. Yet no matter how many nights in the past month his room had been lit by nothing but the bluish artificial glow, the progress bar only showed 90%. What was he missing? He must have completed the main storyline a dozen times now. What secret ending or mini game remained locked? to a halt and steered him over to the keypad to test if he could interact with it. When a quiet “boop” came through his headphones he leaned forward, tensing slightly, his outline silhouetted by another crack of white light. Had he finally found the last hidden part? He tried a few random number combinations but to no prevail. Banging his hand on the desk he moved his character away from the keypad, and began searching the surrounding area for a number that might fit the keypad. The halls walls were dark and simple, with a maze of wires stretching over it. Suddenly Jake leaned forward, his nose almost touching the computer screen. He clicked his mouse on a particularly thick clump of wires. Nothing. Another one. This time the wires vanished, and a number was revealed. Moving quickly Jake punched the numbers into the keypad and waited. A video popped up on screen, and he was surprised to see that the video was not animated caricatures, this was a real life video feed, shot in what seemed to be a park, the rushing of wind almost deafening, no other noise, just a simple pan of a handheld camera surveying the grass the trees, coming to rest on a wooded area towards the end of the park. Then just as suddenly as it appeared it vanished almost in sync with another lighting strike outside his bedroom window. edge of the trees, focusing in on a rather large fallen log for a few moments then, just as quickly as the other one, the video closed. Curiosity still unsatisfied, as this video seemed to provide more questions than answers, Jake continued forward, finding another keypad and number within moments. This time a video came up showing a figure dressed in robes standing atop the fallen log, its shadowed face tilted to the side, in an almost questioning manor. The camera traveled closer, closer, stopping only feet away from the figure though even with such proximity, the camera quality was to low to make out more than a dark blob as the figures hooded face. The figure turned ever so slowly and gracefully, like a glass dancer in a jewelry box, and pointed down to the hidden side of the log with a pale hand, the dark maw where it’s face would be still turned towards the camera. Obliging the figures orders the camera person climbed on top the log and peered down over it. There, half buried in blood soaked soil and leaves was the severed head of a teenage girl. The camera focused on it for a few moments, allowing Jake to watch, eyes bugging as a beetle crawled across the girls snow white skin and see her eyes staring back at him like cloudy, mucus covered marbles. Jake let out a small half laugh as the video closed automatically, and shuffled about in his seat, casting a quick glance over each shoulder as the storm continued like intermittent fireworks outside his window. This had to be some sort of prank right? He’d gotten the game from an internet forum for those who wanted to play big label games without paying for them. Someone had just added this little prank into the bootlegs files right? Then why couldn’t he shake the feeling that something more sinister was happening? Sitting rigid in his seat he hardly remembered finding the next pinpad and number, he only snapped back into the present when the video popped up, he jumped back, lightning illuminating his shadow on his bedroom wall, as in this one, the hooded figure was all that filled the screen, the face a dark pit from which boomed a static filled voice over his headphones. The voice was distorted, crackling and jumping in pitch and tone. Jake desperately pounded the escape button but the video continued to cover the entire screen. With those words the screen changed to a bright blue error message and the monitor crashed with a high pitched beep. Staring at his computer, mouth open, every hair on end, mind frozen, Jake failed to notice the lighting project two human shaped shadows on his bedroom wall. That was an amazing story by Nightsong!! I personally love it because of how suspenseful it is.